In October, we told you about the #CapeFearlessChallenge, a fundraising partnership between Random Acts and the ladies from One Tree Hill. With your help, we raised over $60,000 to provide aid to those affected by Hurricane Florence. We have been using these funds to spread kindness to those who were hit hardest by the storm, but there is still plenty of work left to do. That’s where No Quarter: The Led Zeppelin Legacy comes in. On February 2, we’re going to rock and roll to raise even more money for hurricane relief! How awesome is that? 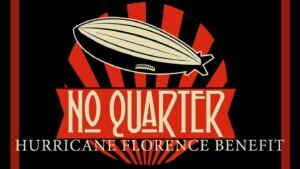 No Quarter is a Led Zeppelin tribute band that has been amazing fans for over 15 years. No Quarter goes above and beyond simply playing Led Zeppelin’s songs, though. Band members work hard to emulate Led Zeppelin as if they were actors performing the role of Led Zeppelin on stage during concerts. When Led Zeppelin’s bassist John Paul Jones met his No Quarter counterpart, Chad McMurray, he saw a photo of Chad in character and commented, “That’s scary. As long as you’re doing it, means we don’t have to.” Those who attend the tribute concert on February 2 are truly in for a treat! The concert will be taking at Wilson Center, Cape Fear Community College in North Carolina at 7:30 PM on Saturday, February 2. You can read more about the concert and buy your tickets here. Make sure to mark yourself as attending on the Facebook event, too! Proceeds from this concert will be supporting Cape Fear Community College students while they get back on their feet after Hurricane Florence. You can still help, even if you don’t live near Cape Fear. Check out this online auction, featuring unique art and entertainment experiences. Proceeds from the auction also benefit Cape Fear Community College students impacted by Hurricane Florence. The auction runs through February 9. Not an auction kind of person? That’s okay– you can still donate directly through the #CapeFearlessChallenge CrowdRise page. As always, you can support the kindness movement any time, anywhere, by practicing kindness towards others in your life.